Open channel flow is defined as flow in any channel in which the liquid flows with a free surface: examples include rivers and irrigation channels. Certain closed channels such as sewers, when flowing partially full and not under pressure, are also classified as open channels, which are used to conduct liquids in most sewer systems, sewage treatment plants, industrial waste applications and irrigation systems. A flume is a specially shaped open channel flow section providing a restriction in channel area (Figure 1). The flow rate in the channel is determined by measuring the liquid depth at a specified point in the flume. The design of the flume is determined by the width of the throat: the bigger the throat the more flow through the flume. Common materials of construction are stainless steel, fibreglass and concrete. Similar measurements can be made with other flow restricting devices such as rectangular or vee-shaped weirs. 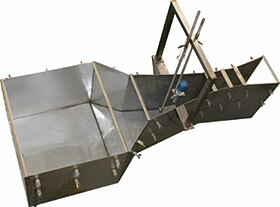 However, flumes result in a lower head loss and are inherently self-cleaning, thus requiring less maintenance. Figure 1. Schematic layout of a flume in a river channel. A secondary measuring device is used in conjunction with the flume to measure the rate of flow in the open channel. The ‘flowmeter’ measures the liquid level at one point in the channel and then converts this measurement into flow rate based on the known level-to-flow rate relationship of the flume. There are a number of technologies for measuring the level in the channel. The most common is the non-contact method utilising ultrasonic and radar sensors. The open channel flow meter uses software to convert the nonlinear level measurement into a flow rate. WIKA recently received an order to supply 3-inch and 9-inch Parshall flumes constructed from 2 mm 316L stainless steel. The flumes will be installed at the NCP Chlorchem site to measure exit effluent flow into the Jukskei River. As mentioned previously, the level probe must be positioned at a special point in the throat of the flume. A frame has been attached to the walls of the flume positioning the level probe in the correct position. This will simplify the installation, as there will be no confusion as to where the level sensor must be positioned. The frame serves two purposes: one is to position the level sensor correctly; the second is to provide the capability to check the zero and range calibration of the flow meter while there is flow through the flume. As can be seen in the image above, there are tabs attached to the side of the flume. This is for securing it into a concrete structure and to prevent the sides from caving in. The straps across the top are for structural support during installation only, once the concrete has cured they will be removed. 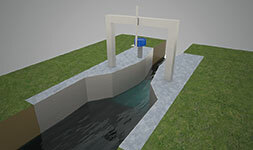 • Sewage works: because of the self-cleaning effect, no debris is collected on the side walls. • Factory-treated effluent discharge into rivers. • Measurement of irrigation water in open channels to predefined areas. • Discharge water from purification plants.